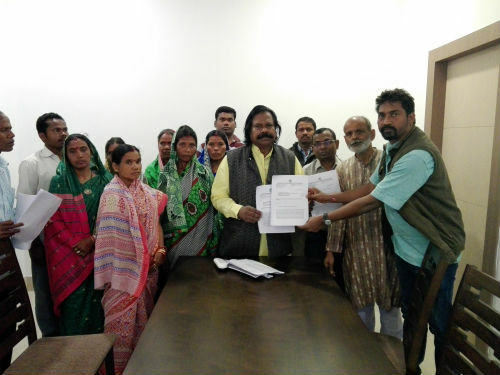 Bhubaneswar: Members of Campaign For Survival and Dignity(CSD), Odisha, the forest rights campaign today submitted memorandum to the Shri Nanda Kumar Sai, Chairperson of National Commission for Scheduled Tribes(NCST) Govt. of India at Odisha State Guest house on the violations of Forest Rights Act and PESA, 1996 by both Govt. of Odisha and MoEF. 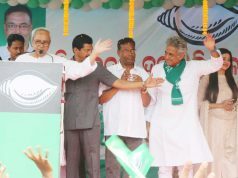 during its four days visit to Odisha. The four members team including Ms. Anusuiya Uikey(Vice- Chairperson), Shri Hari Krishna Damor(Member) and Shri Harshadbhai Chunilal Vasava, (Member) had reached Odisha on 16th Jan to hear allegations against violation of tribal rights in the State. It is to be noted that NCST is formed under Section under Art 338 A of the constitution India give special protection to the tribal rights across the country. In its petition submitted before the NCST, CSD apprised on the violation of various provisions of FRA and PESA by the State Government. Particularly raising the issue of disempowerment of FRA Gram Sabha, CSD alleged that in the whole FRA implementation process, there has been consistent and systematic bypassing of the empowered FRA gram sabhas by the Odisha Govt. Officials. While the Govt. 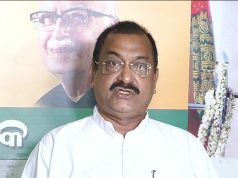 of Odisha claims to be No.1 in issuing highest number of Individual Forest Right(IFR) titles in comparison to other States, CSD brought into the notice of the Hon’able Commission the ground realities. Appraising the Commission CSD said “ Govt. of Odisha have issued title papers to the tribals and even after passing of ten years of FRA implementation, it has failed to demarcate most of the forest land issued under IFR and CFR. CSD also raised level of rejection of IFR claims of both STs and OTFDs. It is to be noted that as per the latest FRA SLMC report by 30th Nov 2017, 1, 28,868 IFR claims (1,23,417 of STs and 25,451 of OTFDs have been rejected out of the total 6,05,588( 5,75,070 STs and 30,516 OTFDs IFR claims filed at the gram sabha level. CSD also apprised the Commission on the poor recognition of Community Rights in the State and how abstractions is being created by the State Forest Department on the way of FRA implementation by pushing illegal Van Surakshya Samittee (VSS) through Ama Jubgle Yojana and sought strong direction to the State Forest Department. 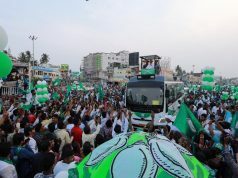 Besides, CSD urged the Commission to direct the State Govt. to issue community forest rights titles to all villages, to ensure ownership rights over Minor Forest Produce, to recognise the individual forest rights of the Other Traditional Forest Dwellers(OTFDs), to identify all forest and un-surveyed villages falling in the reserve forest and to convert them into revenue villages, to monitor the cancellation of IFR titles in coal mining area of Hemgiri Block in Sundargarh district, to respect the PESA Act 1996 and to implement it in its true spirit in the Scheduled 5th areas, to recognise the Habitat rights of all the 13 PVTG/PTG in the State, to implement the central Govt.’s “Minimum Support Price Scheme for Minor forest Produce(MSP for MFP) in its true spirit, to provide white paper on the coverage of implementation of FRA in villages of the State, to enumerate the exact landlessness amongst tribals families of the State and to provide one standard acres of revenue land to each and every tribal families and to endow community ownership rights over all cashew forest/plantation land. Thanking the NCST intervention and recommendation on illegal NTCA order issued on March 28 2017, CSD again sought Commission’s direction to NTCA to immediately withdraw its arbitrary order and praised Commission’s initiative towards enhancement of compensation amount from Rs.10 lakhs to Rs.20 lakh per families willing to be relocated from Tiger Reserves of the country. CSD also urged the NCST to direct the Central Govt. to dismiss the anti-FRA CAMPA Fund Act, 2016 and sought flow of the forest protection and management fund directly to the bank account of the concerned gram sabhas. Talking with the CSD, Odisha members, Nanda Kumar Sai assured them to give necessary direction to both Govt. of Odisha and Govt. of India over violations of FRA, 2006 and PESA, 1996 in the State. Besides CSD members, the community members came from Nayagarh district filed petitions before the Commission to get rights over Cashew land which they have been protecting and depending upon from generations. In the four days visit to Odisha, the Commission members visited Kalinga Institute of Social, attended function of Sri Jaganath Sanskrit University at Puri on 16th Jan. On 17th Jan they visited Raurkela and heard the grievances of the displaced people. On 18th the Commission heard allegation against MCL while land acquisition for coal mines and other tribal right violations. On 19th the commission met with the C.M Naveen Patnaik and Governor of Odisha.